Finally get the long desired iPhone to replace your old Android phone? Then you possibly need to transfer files from Android phone to your new device such as those precious messages recording the sweet moments with your boyfriend of girlfriend. So how do you messages from Android to iPhone? Well, just sync the messages from Android phone to the computer and then from the computer to iPhone? That's too troublesome! Now, this passage tells you how to easily transfer SMS messages from Android to iPhone in an direct manner! 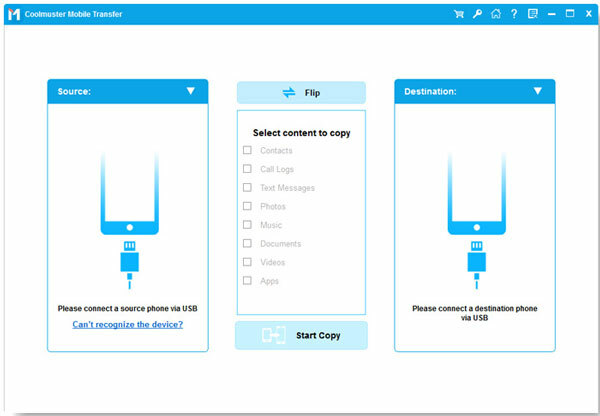 That is, by means of this Phone Transfer software, which allows you to freely transfer SMS messages from Android to iPhone X/8 Plus/8/7 Plus/7/6s Plus/6s/6 Plus/6/5S/SE. With this software, you can directly transfer Android SMS messages to iPhone without any difficulty. 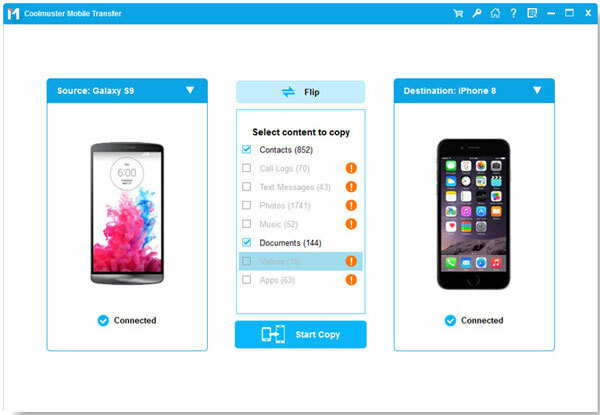 Also, this software can not only support SMS messages, but also suit other files like contacts, photos, videos, apps, and many more. More importantly, this software is fully compatible with devices running Android, iOS and Symbian systems. So you are totally free to share any files among these devices as you needed and wanted! Now, you can get the free trial versions of this software by clicking on the below icon! Step 1. First of all, open the installed software on the computer and then get the two devices connected to the computer via the USB cords. And then you will see the below interface once the software successfully detect the two devices. Then choose the mode of Phone to Phone Transfer to continue the process. Step 2. Enter the right tab to preview the detailed file information and then select the message files you want to transfer from Android to iPhone. On the promo dialogue, you will have a clear picture of the file transferring process. Message transfer from Android to iPhone can be finished within a little while. Syncing Android SMS messages to iPhone can't be more easier! Also want to transfer Android SMS to iPhone? Then you absolutely can't miss this Phone Transfer software. By the way, the tutorial in the above only takes Windows version as an example. If you are a Mac user, just download the right version and follow the same steps!